Interested in learning more about the history of the Hawkesbury Region? Why not enjoy one of several Self-guided Heritage Walks and Drives which have been designed to take in both significant and interesting locations in this historic district. Click on the headings to download a complete PDF of the Heritage Walk. This drive commences in Kurrajong Village, travels along Comleroy Road, then East Kurrajong Road, crosses the Hawkesbury River at Sackville Ferry and then proceeds on to the Lower Portland Ferry. The road then follows the course of the Colo River from its confluence with the Hawkesbury and on to Upper Colo where the drive climbs the ridge then descends again to cross the causeway over Wheeny Creek. After following the length of Comleroy Road the drive ends where it meets Bells Line of Road at Kurrajong. Commencing at St Peters Anglican Church this walk includes many buildings constructed during the first hundred years of European settlement. This walk commences in Richmond Park and takes in nearby residential areas in addition to the original commercial heart of the town which grew up along Windsor Street during the late nineteenth and early twentieth centuries. This tour commences in Paget Street and includes the eastern section of Richmond including Francis, Jersey, Bowman and Pitt Streets returning along Windsor Street to Paget Street. Commencing in March Street this walk takes in the south eastern section of the town and includes dwellings dating from several periods of development of the town ranging from the 1840s to the 1880s. The precinct is named after the Hawkesbury Agricultural College (now University of Western Sydney–Hawkesbury) which was established in 1891. This walk features many fine examples of nineteenth and early twentieth century buildings. 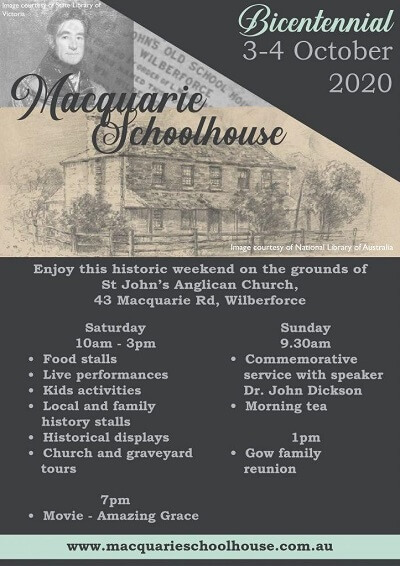 The square was named by Governor Lachlan Macquarie in honour of his friend Andrew Thompson and was originally the centre of the village known as Green Hills which was proclaimed the town of Windsor by Governor Macquarie in December 1810. The site of early land grants between 1794 and 1798, this area was known as The Peninsula by 1802. In 1842 the area was subdivided into suburban lots and offered for sale by Laban White. The area today includes a variety of housing styles ranging from Victorian cottages and inter-war bungalows to modern houses all of which contribute to the unique character of the streetscape. Commencing at the waterwheel near Baker Street, this walk travels through the commercial heart of Windsor returning to Thompson Square via The Terrace. A variety of architectural styles may be observed above street level. Many buildings were constructed as residences but were later converted to shop fronts as the demand for commercial premises grew. The walk also takes in several churches and the Windsor Reservoir, an item of industrial heritage significance. Walking along George Street from New Street to the Windsor Railway Station and back along The Terrace, discover the residential areas of Windsor as they have developed around McQuade Park. 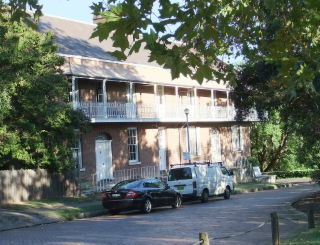 The park was planned by Macquarie when the town was laid out in 1810. Of special interest is St Matthews Anglican Church which was commenced in 1817 during the time of Governor Lachlan Macquarie and its associated burial ground and rectory.